One of the more difficult situations you may face as a parent is dealing with a son or daughter's coach who is a bully. Knowing the statistics on bullying and personality disorders, the person who is responsible for your son or daughter's athletic development and advancement may very well be a bully. Yet unlike the typical "schoolyard bullies," the type of bullies you may find in coaching, teaching, or even as parents, are harder to recognize. Sadly, many parents do not even realize that their son or daughter's coach is bullying him or her. Instead, they trust in the coach's position, and falsely believe that the coach is not even average, but excels at being tough and pushing kids to succeed. Considering this scenario, it stands to reason that bullying in youth sports can have significant consequences. Imagine a child who is not only being bullied but the supportive adult figures in his life support that bullying. If you are a parent and this is hard to read, please read on. Bullying by a coach can impact your son or daughter's health, overall wellbeing, and his or her interest in the sport. There are many negative effects of bullying. In fact, many kids have quit playing a sport they once loved simply because the coach was a jerk. Therefore, it’s important to distinguish between a tough coach and one who is a jerk or a bully. Here are six signs your child is being bullied, in this case, specifically by a coach. If you've listened to your child talk, you may have wondered if his coach is a bully. If you haven't listened, please listen again! But how can you tell if that coach is a bully, or is instead is a compassionate person who is firm because he wants to see your child succeed? In our current "narcissistic era" in which millennials are spoken of as "soft," it can be far too easy to dismiss firm behavior on the part of a coach. Parents who enjoy the millennial videos on youtube, though sometimes fairly accurate, may easily overlook what is actually severely abusive behavior toward their child rather than ask the necessary questions. This is only one of the ways in which bullying impacts a family. While it may sound difficult to tell the difference, there are clear signs that can distinguish a "tough" coach and a bully coach. Here are six clues to look for that may open your eyes. Verbal put-downs from a coach, in front of others, are a clear form of verbal abuse. For instance, a bullying coach may humiliate your son or daughter in front of others. He may also shout, swear or yell on a consistent basis or make offensive jokes at your child's expense. Verbally abusive coaches may also make snide remarks or offer unfair criticism about your child's abilities or performance in a game. Meanwhile, a tough coach will offer constructive criticism and direction. He might do it with a stern voice, but the words are never hurtful or shaming. And, as often as possible, he or she will do it in a private setting which does not shame your child. If your son or daughter's coach intimidates your child (or other players) on a regular basis, this is a sign of abuse. Intimidating behavior may include threatening your son or daughter with severe consequences as a way to maintain power and control over him. It may also include threatening gestures, screaming or making threats to harm him physically when he makes a mistake. If you have daughters, the abuse may not be obvious but can be just as damaging or worse. Intimidating comments in private can be every bit as controlling as those on the field. Likewise, female coaches may have less obvious but no less abusive ways of manipulating their players. A bullying coach may exhibit control by questioning your son or daughter's commitment to the team. Bullies often make fun of or question a player’s abilities by belittling him. This may be done in private or in front of others. 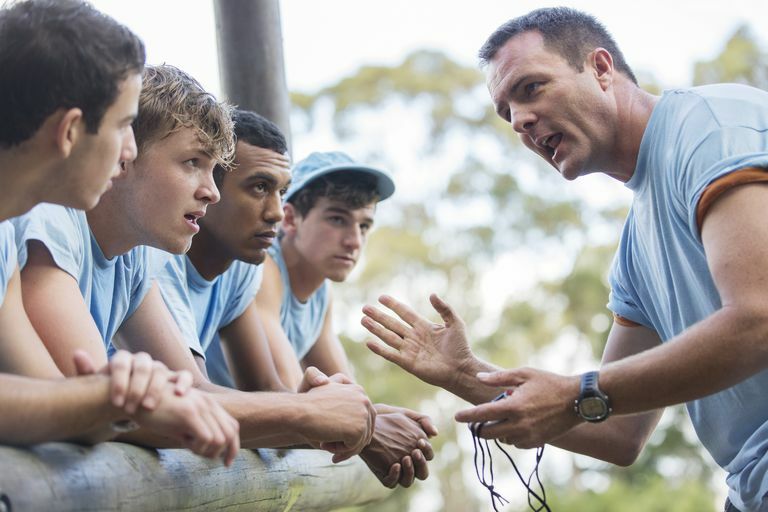 A bullying coach may also blame others for losses or mistakes in a game while boasting that their skills as a coach are responsible for good outcomes. If you are familiar with blame shifting, watch for this practice. Coaches may question your child's commitment to the team if your son misses practices due to school commitments or family obligations. You may empathize with a coach who wants to put the team first and requires utmost commitment. But keep in mind that even if your child puts in long hours and sacrifices personal time, it still may not be enough for this type of coach. With a bullying coach, the circumstances don't necessarily matter, only that the coach remains in a "one-up" position of control. Coaches may undermine or impede the success of a child. This is especially common among bullying coaches who set unrealistic goals or guidelines for their teams. Doing so increases the chance of failure. What’s more, this type of coach may bench your son if he knows a scout is coming to watch him or if you have a lot of family at a game. These coaches may also punish your son for mistakes that are not his or bring up past mistakes in order to shift blame for reducing playing time. They may make it impossible for your son to make a higher level team within the organization. To understand some of this behavior it's necessary to know a little bit about cluster B personality disorders. Thought to be present in perhaps 10 to 15 percent of people, conditions such as narcissistic personality disorder can be difficult to understand. No matter how much you may try to understand what your child's coach is doing, it may escape you. This is often because people without personality disorders think in a different way. With normal personalities, people experience empathy and compassion. A lack of empathy in another adult, especially a coach, doesn't fit with the mindset of a parent who does experience empathy. Whereas healthy people feel guilt and remorse, those with some of these personality disorders do not experience these feelings, and consequently, do not feel bad when they bully a child. If your son or daughter's coach talks bad about your son to other coaches or spreads rumors, open your eyes. Bullies often go to great lengths to make others look bad. As a result, they may gossip with others or spread rumors about your child’s performance, his abilities, your parenting and his future in the sport. The goal is to undermine your son’s success and to maintain control in the situation, especially if you have reported the coach or talked with him about his behavior. Don't expect a coach like this to change when confronted with his behavior. Instead, if he has a personality disorder, a complaint may only escalate his behavior, a process known as a smear campaign. Bullying coaches also might exclude your son or your family socially. They leave you off party lists and don't include you in team outings, dinners or meetings. They also may schedule practices or other events when they know you have a conflict in your schedule. And they may go so far as refusing to allow your son to attend games or events. We hear a lot about bullying among peers, but bullying may occur from coaches, teachers, or even parents. In fact, bullying from adults in a position of authority such as coaches can have a much more devastating impact. Where is a child to turn? If his parents believe his coaches, who can he talk with? If your child is experiencing any of these abuses, it’s important to recognize that this type of bullying, while common, is not a normal part of youth sports. Repetitive verbal abuse, exploitation, name-calling, physical bullying and other activities that repeatedly demean your son or daughter or are not only discourteous and wrong but also will eventually take a toll on your child. Help your child learn to recognize bullying for what it is so that he does not blame himself for someone else’s behavior. Remind him that bullying does not mean there is something wrong with him or that he will never be a good player. Instead, bullying is a choice that is made by the bully. We can't overstate the importance of this. If your child has been bullied, you may need to tell him or her over and over that it is not right. A child who has been taught to respect authority may have a very hard time coming to grips with having an adult in their lives who do not have their best interest at heart. It can also be emotionally devastating in another way, as children who are exposed to a bullying adult learn that the world is not a safe place, even among those who are respected authorities. Take the time to teach your child the difference between bullying and normal conflict. It's critical that parents keep their eyes open to recognize bullying from their child's coaches or teachers. Parents are a child's advocates, and without that, they are left alone to defend themselves in a world where they have little stature. As a parent, take some time to learn about the surprising ways parents do not know about bullying. If your child has been bullied by a coach, you may hesitate to do anything. You may worry that doing something with make life harder for your child. Yet your child is depending on you to stand up for what is right. If you are concerned, try to find others who are likewise concerned. Even if you are alone there are options. Consider filing a complaint with the sport's organizers or directors. And even if your child has left the sport (for obvious reasons) keep in mind that filing a complaint may prevent another child from being bullied by this coach. Additionally, keep the situation in perspective but take steps to protect your son’s self-esteem (to prevent bullying) and health. We know that many primary care visits have nothing to do with the symptoms given the receptionist, and are a good opportunity to learn about psychosocial stressors in a child's life. According to one study that looked at the role of general practitioners in assessing bullying activity, young people would welcome having their family practice doctors becoming involved as their advocate in bullying. For parents, this means that sometimes a child may welcome the opportunity to talk with their family doctor, and making an appointment with their GP may be helpful if they are hesitant to talk at home. It's important that parent's keep their eyes open for bullying by the coaches of their sons and daughters. In some cases, it can be hard to discriminate between a tough coach (one who has your child's best interests in mind) and a bullying coach. Sadly, bullying coaches are far too common, and without open eyes, can be easily missed. Make sure you are familiar with the signs of bullying by coaches and other adults. Teach your child to recognize these as well. Most importantly, listen to your child if he complains about a coach, even if you think it is just a drama thing. It is actually very difficult for children to bring up these issues, and if your child has, it is something to look into closely. If you've identified a bullying coach, think about your choices carefully. You may hesitate to make waves, but carefully weigh the repercussions of addressing the problem relative to your very real family problem; your child may permanently lose interest in a sport he once enjoyed. Do a little research. If other families have similar concerns all the better. Yet, even if you are the only one, standing up for your child will not only let your child know that his parents will go to bat for him but may spare other children from being similarly abused. Remember that psychological and emotional abuse is just as bad as physical abuse, and in some ways more difficult. Bruises and broken bones heal, but a child's psyche can take years or decades to do likewise. As a last note, take a moment to learn about ways to prevent bullying no matter the setting in which it occurs. National Association of Youth Sports. Is Your Child’s Coach a Bully? Scott, E., Dale, J., Russell, R., and D. Wolke. Young People Who Are Being Bullied—Do They Want General Practice Support?. BMC Family Practice. 2016. 17(1):11.